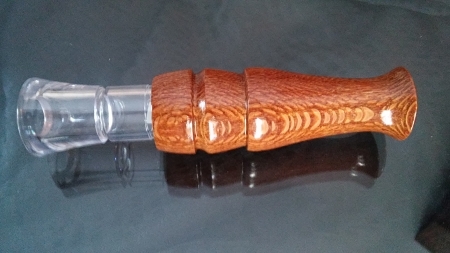 My Goose Calls are Finished to the highest quality, these calls look more like furniture than they do a game call, but don't let that worry you about taking it into the field! The Same LIFE TIME WARRANTY applies, run it over with your truck, send it back, I will replace it. Both the Canada Goose Call and the Speck Call are the easiest calls on the market to blow, they simply do not take near the air that many of our competitors do. and They sound FANTASTIC! It is a very versatile call. I make them from almost all the same woods as I do my Mallard Calls, so if you see a wood somewhere on this website that interests you but you don't see it in the Goose Call section, just give me a call, I will take care of you! Woods include; Walnut, Cherry, Iroko, Sapele, African Cherry (Pictured), Leopard Wood, (pictured), and Padauk. Indian Palm, Bocote and Cocobolo are special order only, call from pricing.